Three reasons to love this gorgeous sight words kit. 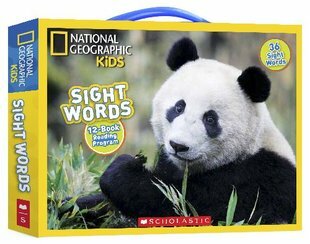 1) It’s packed with facts that bring you up close to a world of wildlife, all with National Geographic’s iconic colour photos. 2) It teaches you essential sight words in a simple 12-step programme. Just finish one book and move onto the next. 3) Lots of the books help you with must-know first concepts, from sizes and counting to telling the time. What’s not to love? Pandas, puffins, lions, chimps: first reading just got WILD!